Like bunions, hammertoes usually start out as mild deformities that get progressively worse over time. In their early stages, hammertoes are flexible and not especially sore. But if left untreated, they become increasingly rigid – and painful. 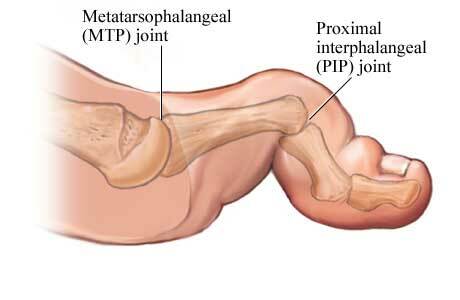 The most common cause of hammertoe is an imbalance in the muscles and tendons that can lead to structural changes – i.e., bending and even joint dislocation – in the affected toes. Common symptoms include pain or irritation, as well the development of corns and calluses (areas of thickened skin) on the bottom of the toe or on the ball of the foot, which are often painful in their own right. Luckily, there are a variety of treatment options, including trimming of corns and calluses (leave this to the professionals; attempt it yourself and you run the risk of a serious infection). Your doctor may also prescribe orthotics or non-medicated pads. In some cases, patients are fitted with splints or small straps to realign the bent toe; corticosteroid injections are also used. In advanced cases, surgery is required. The most common surgical procedure is called arthroplasty, in which the surgeon removes a small section of the bone from the affected joint. Another option, arthrodesis, is usually reserved for more severe cases in which multiple joints or toes are involved. In this procedure, the surgeon fuses a small joint in the toe, implanting a pin or other device to hold the toe in position while it heals. Keep your feet pain-free this summer!